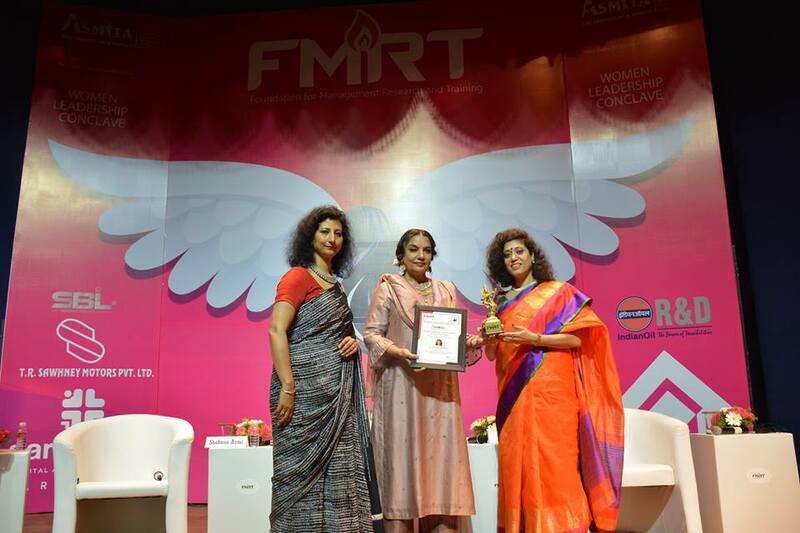 Director General, GLBIMR, Greater Noida, has been conferred with ‘WOMAN ACADEMIC LEADER AWARD’ in Higher Education Category, by Padma Bhushan Ms. Shabana Azmi, the Legendry Actress, renowned Social & Women’s Right Activist and Ex- Member of Rajya Sabha at ASMITA -Women Leadership Conclave. 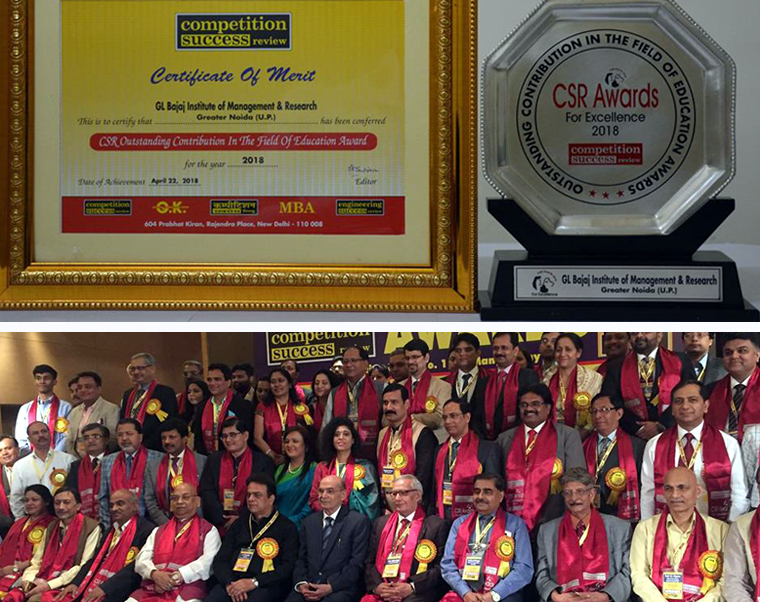 With great pride & honor, we share that GL Bajaj Institute of Management & Research, Greater Noida, has been recognized amongst the "Top Institutes of India" and conferred with the "CSR Award for Excellence 2018" by Competition Success Review (CSR) for the third consecutive year for its significant contribution towards achieving Education Excellence in India. 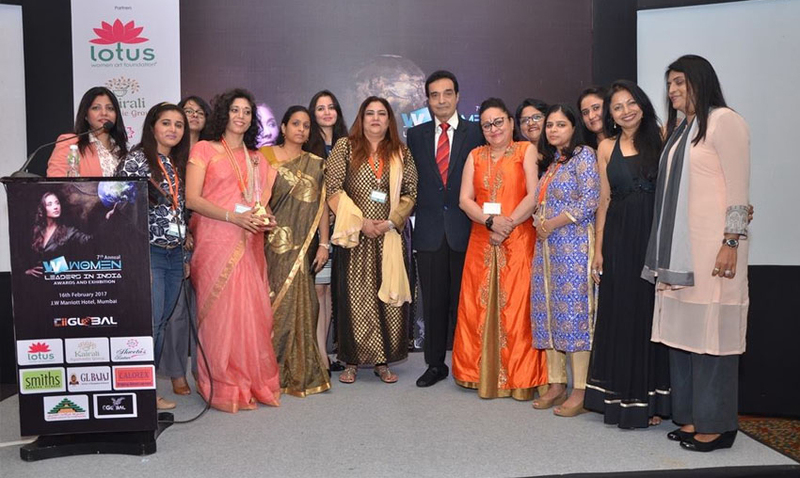 The awards were received by Dr. Urvashi Makkar at a scintillating Awards Night organized on April 22, 2018 at The Le Meridian Hotel, New Delhi. Dr. Makkar mentioned that these achievements would not have been possible without the constant guidance of Mr. Pankaj Agarwal, Vice Chairman, GL Bajaj Educational Institutions, and dedicated the accolades to the team effort of each member of GLBIMR. Continuing the legacy of its stellar performance, under the visionary leadership of our Vice Chairman, Mr. Pankaj Agarwal, GLBIMR has been steering forth as a leading B-School in India. With great pride & honor we share that Dr. Urvashi Makkar, Director General, GLBIMR, was conferred with 'Women Leadership Award for Promotion of Responsible Management Education', at the 1st Global Conference on Marketing Management Studies Matter (MMSM-2017) by Canara Bank School of Management Studies (CBSMS), Bangalore University in association with Regional College of Management (RCM), Bangalore on November 26 2017. The Conference were organized in collaboration with the United Nation Global Compact (UNGC), India. The highly prestigious award was conferred by Prof. Ronald E. Berenbiem, Stern School of Business, New York University, in presence of Dr. K. Janardhanam, Professor & Director – CBSMS, Bangalore University, Dr. Shiv K Tripathi, Sr. 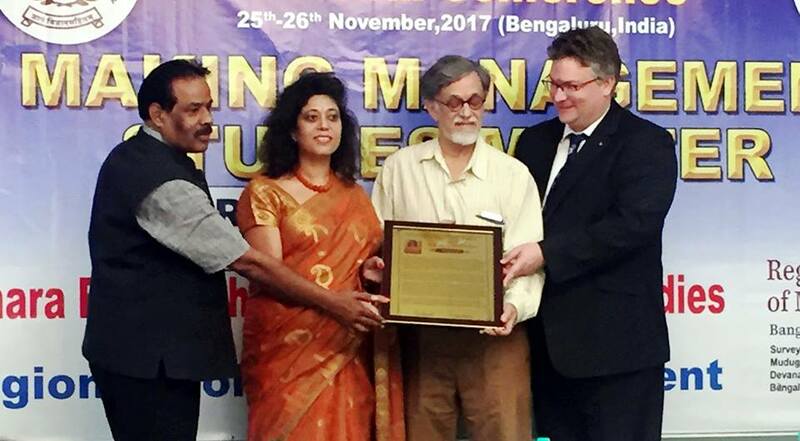 Professor & Dean, CMR University, Dr. Pooran Chandra Pandey, CEO, Dialogue of Civilisations Research Institute Berlin, Germany, Dr. Subhash Sharma, Director, IBA, Bangalore and Prof Wolfgang Amann, Conference Co-Chair, during the Valedictory Session of MMSM-2017 The award was conferred to Dr. Makkar for her extra ordinary contributions in the field of higher education, employability & skill enhancement. GLBIMR is proud to be led by such visionary leader. "If your actions inspire others to dream more, learn more, do more and become more, you are a leader"; we are blessed to have one such visionary leader to guide us, in Dr. Urvashi Makkar, Director General, GLBIMR. It is a pleasure to share that, Dr. Urvashi Makkar has been conferred with "Shakti Achievement Award" at the 10th National Women Excellence Award 2017, organized on November 25, 2017 at India International Center, New Delhi. The event was organized in association with North Eastern Council (NEC), Ministry of DoNER, Government of India, Indo European Chamber of Small and Medium Enterprises (IECSME) & other National and International organizations. Smt. Krishna Raj, Honourable Union Minister of State for Agriculture and Farmers Welfare , Mr. Anuj Agrawal, Editor, Dialogue India ( Career Magazine), Smt. Laxmi Thakur Singhal, National General Secretary, YCI, Smt. Chitra Dalal, Vice President, IECSME & Dr. Kamal Taori, Former Secretary to Government of India, Chairman IECSME conferred the award to Dr. Makkar in a grand award ceremony. This is a proud moment for all of us!! GLBIMR conferred with "Best Institute in North" Award !! 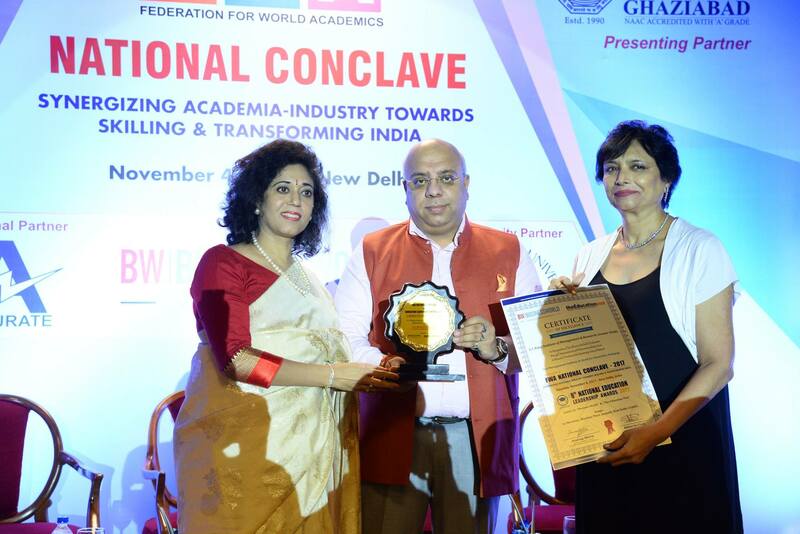 We feel highly elated in sharing that GLBIMR has been conferred with "Best Institute in North for Innovative Pedagogy" Award, by Federation for World Academics (FWA) during the National Conclave, on November 04, 2017, in a scintillating award ceremony at Hotel Le Meridian, New Delhi. The highly prestigious award was conferred to Dr. Urvashi Makkar, Director General, GLBIMR, by Mr. Anurag Batra, Chairman and Editor in Chief, BusinessWorld. Congratulations to whole GLBIMR family for this great achievement !! 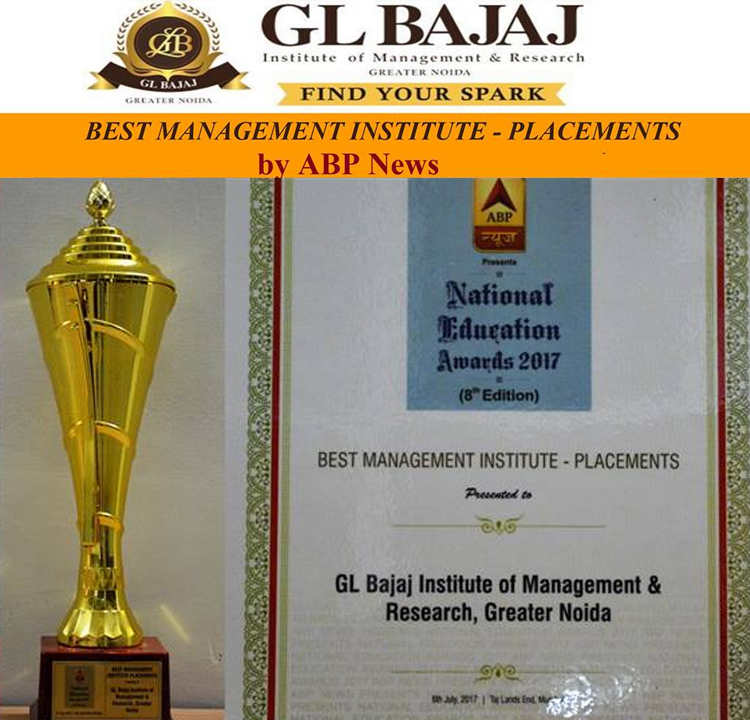 GLBIMR conferred with highly prestigious award-“Best Management Institute – Placements” by ABP News !! We feel highly elated in sharing that GLBIMR has been conferred with another highly prestigious award -“Best Management Institute – Placements” by ABP News Network, in a glittering awards night, on July 06, 2017, at Hotel Taj Lands End, Mumbai, during 8th The National Education Awards 2017. Dr. Urvashi Makkar, Director General, GLBIMRheld high, the illustrious award with much honor & pride, in the event which witnessed presence of corporate & academia business leaders from all across country. Awards like these are, very prestigious and well researched, chosen by an independent jury and a panel of professionals who believes in nurturing talent and in recognizing the outstanding management institutes. Dr. Urvashi Makkar shared that this achievement is a ‘domino effect’ of the continuous efforts of the institute, towards academic excellence and skill enhancement, resulting in outstanding placements. The profound leadership of Mr. Pankaj Agarwal, Vice Chairman, GL Bajaj Educational Institutions, has been the guiding light on the path of success. We congratulate GLBIMR family for this outstanding achievement. GL Bajaj Institutions, Greater Noida Campus, received the Swachhata Award !! We feel highly elated to share that based on Inspection & Survey conducted by the state authorities, GL Bajaj Institutions , Greater Noida campus, received the "SWACHHATA AWARD", for being the cleanest campus. 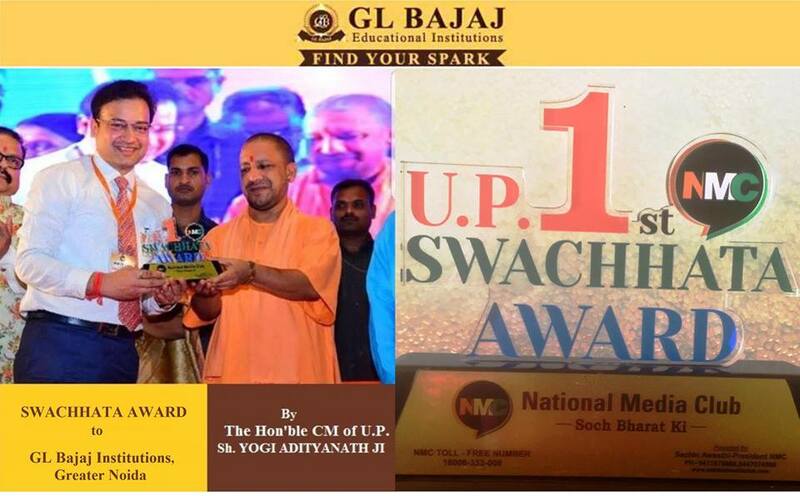 The Hon'ble Chief Minister of Uttar Pradesh, Sh.Yogi Adityanath Ji, conferred the award to Mr. Pankaj Agarwal, Vice Chairman, GL Bajaj Group of Institutions in a glittering award ceremony held at Lucknow. 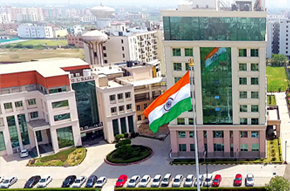 GLBajaj is the only academic Institute to receive this highly prestigious award, for its impressive, clean, well kept and pollution-free campus with panoramic green surroundings. It's indeed a proud moment for GL Bajaj Institutions, Greater Noida campus. Congratulations to whole GL Bajaj Family !! GLBIMR did it again ! !- "CSR Excellence in Education Award 2017"
We are proud to share that GLBIMR has once again won the “Excellence in Education Award" at a scintillating Awards Night by Competition Success Review (CSR). This is second time in a row that GLBIMR has won this prestigious award. Under the visionary guidance of Mr. Pankaj Agarwal, Vice Chairman, GL Bajaj Group of Institutions, GLBIMR has been recognized for the significant contribution towards achieving Education Excellence in India. 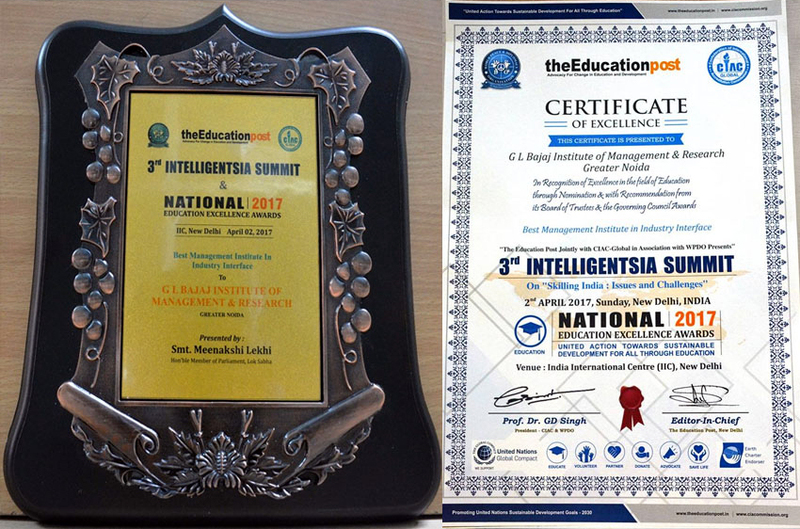 In continuation to the series of several Awards & accolades received by GLBIMR, we feel highly elated in sharing that GLBIMR achieved another milestone at the National Education Excellence Awards 2017 held on April 2, 2017 and has been awarded as, “Best Management Institute in Industry Interface”. Dr. Urvashi Makkar, Director General, GLBIMR, received the honour from Prof. D S Chauhan, President, Association of Indian Universities (AIU), New Delhi, during the 3rd Intelligentsia Summit -2017, where GLBIMR was also the official knowledge partner. During the intellectual panel discussion, Dr. Makkar, who was invited as a distinguished speaker, shared her views on “Business School Perspective on Skilling India”, along-with the other renowned panelists, Mr. Sandeep Tyagi, Director, HR, Samsung India, Prof. Goutam Dutta, IIM Ahmedabad, Prof. Irfan A Rizvi, IMI, New Delhi and Prof. Mahesh Gandhi, Director General, Educomp Ltd. An Achievement like this, keeps the faith in hard-work, intact and robust. GLBIMR is on its way of writing more success stories, under the guidance of Mr. Pankaj Agarwal, Vice Chairman, GL Bajaj Group of Institutions and Dr. Urvashi Makkar, Director General, GLBIMR. With great pride & joy, we share yet another success story of GLBIMR. Under the insightful guidance of Mr. Pankaj Agarwal, Vice Chairman, GL Bajaj Group of Institutions and Dr. Urvashi Makkar, Director General, GLBIMR, the Institute is creating new success records. 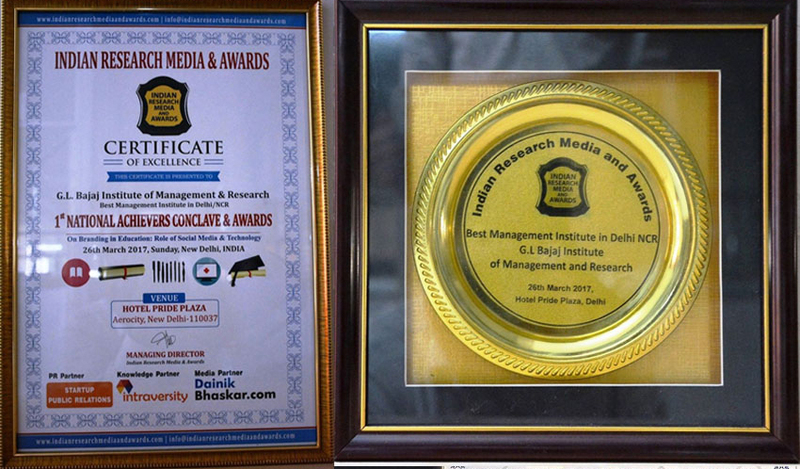 Recently GLBIMR was awarded as “Best Management Institute in Delhi NCR”, by Indian Research Media and Award (IRMA), at the National Achievers Conclave and Awards 2017 on March 26, 2017 at Hotel Pride Plaza, Aerocity, Delhi. Dr. Urvashi Makkar was also conferred with “Best Director General” award, for her exemplary contributions in the field of education. Mr. Prem Pal Sharma, Former Joint Secretary, Ministry of Railways presented the awards in the spectacular award ceremony, which was preceded by an intellectual conclave, where Dr. Urvashi Makkar was invited as eminent panelist, along with other renowned academicians and corporate experts. The successful event was conceptualised and executed in a highly organised manner by Mr. Arun Sachan & Ms. Deepali Sachan of IRMA. Dr. Makkar, while extending the vote of thanks, shared that, this success could have been achieved only by the constructive team efforts of all GLBIMR members and most importantly due to the visionary leadership of Mr. Pankaj Agarwal. May the success that has come our way today lead us to bigger achievements in the years to come. Congratulations GLBIMR! With much pride and honor, we share that another, ‘feather in cap’ is added in the legacy of GLBIMR!! Under the leadership of Mr. Pankaj Agarwal, Vice Chairman, GL Bajaj Group of Institutions and Dr. Urvashi Makkar, Director General, GLBIMR, the institute is excelling towards new heights of success. Mr. Pankaj Agarwal, Vice Chairman, GL Bajaj Group of Institutions was awarded as the ‘Edupreneur of the year 2017’ for his outstanding and exemplary contribution towards education and GLBIMR has been conferred with ‘Best Management College in India for Placement 2017’ by Global Education and Skill Summit on March 25th, 2017 at Multi Purpose Hall, India International Centre (New Building), Max Mueller Marg, 40, Lodhi Estate, New Delhi. 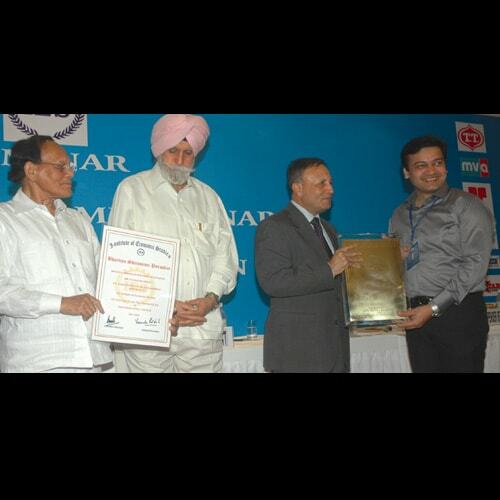 Dr. Makkar received the award in this scintillating award ceremony from Mr. JP Yadav, Honourable Member of Parliament and Dr. Manpreet Singh Manna, Director , AICTE and President CEGR. The event witnessed participation of more than 200 delegates from the world of corporate and academia. Awards like these not only bring honour to the institute but also increase the motivation to excel amongst all stake holders. The award ceremony was broadcasted on News India TV Channel. 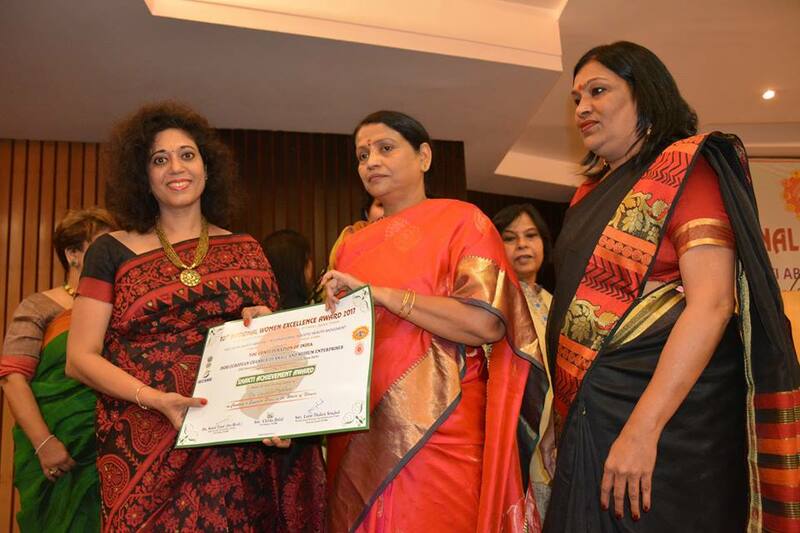 Leading women in Education Award to the Director General, GLBIMR at the 7th Annual Women Leaders in India & Awards, in February 2017. With great pride, we share that Dr. Urvashi Makkar, Director General, GLBIMR was conferred with highly prestigious “Leading Women in Education” Award at the 7th Annual Women Leaders in India & Awards, on Feb 16, 2017 during a glittering ceremony at JW Marriott Hotel Juhu, Mumbai. GLBIMR was showcased as the Academic partner of the event and Dr. Makkar was invited as one of the eminent speaker at the conference, where she presented her insightful views on the topic- “The Power of Women’s Voice”. Veteran Actor, Producer & Director, Mr. Dheeraj Kumar, conferred the awards to women achievers from diverse area from all over India. “Women Leaders in India and Awards” has become an integral part of the Indian business calendar, celebrating the remarkable achievements of successful women leaders, entrepreneurs and professionals. This year also some of the prominent and influential women leaders and entrepreneurs were felicitated at the Mega award night. Along with our Dynamic Director General, Dr. Urvashi Makkar, other leading ladies to receive the honour were: the veteran Actress & famous Singer, Ms. Salma Agah, Ms Rituparna Sengupta, renowned Indian Actress, Ms.Deepshika Nagpal, Famous Indian TV & Film Actress, Ms. Vaishnavi Patwardhan, Miss India finalist, Ms. Fauzia Arshi, COO, Daily Multimedia Ltd and more. The Gala event was graced by the glitterati of Indian Cinema, Media and Fashion Industry. It was one of the most talked about event in Mumbai where GLBIMR was showcased as Academic Partner. This is a proud moment for all of us and you can be a part of our joy by having a look at the Mega event through our Album. Proud moment for GLBIMR at BBC Knowledge Education Leadership Award, Mumbai !! 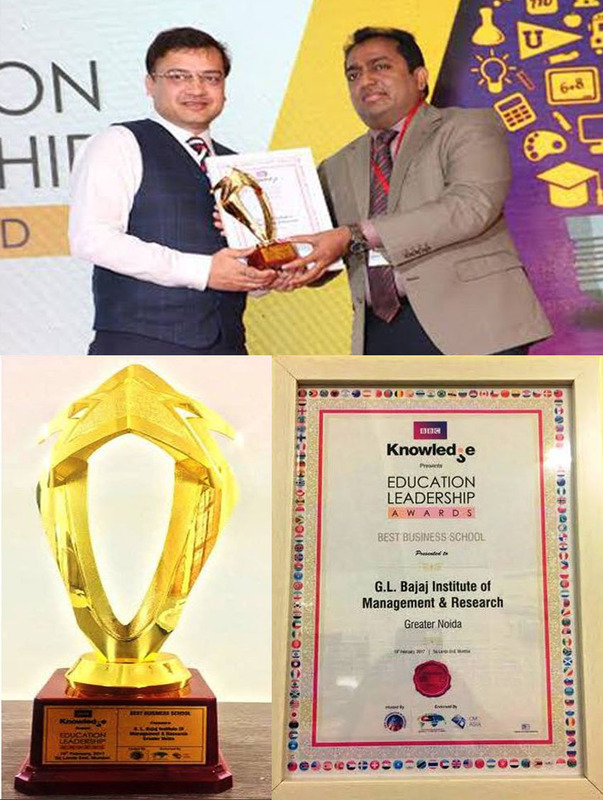 In a scintillating event organized by BBC Knowledge at Taj Lands, Mumbai GLBIMR was conferred with highly prestigious and eminent “Best Business School” award by BBC Knowledge. 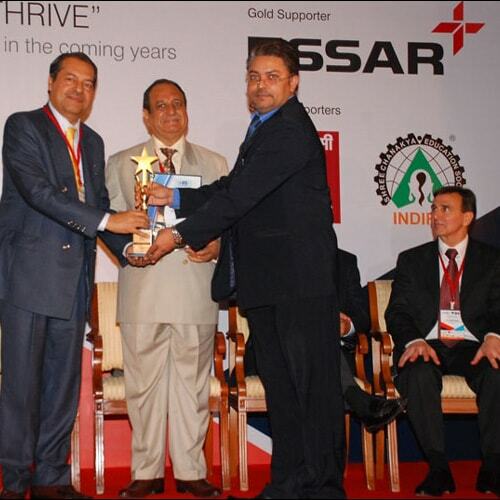 The award was received by our dynamic leader, Mr. Pankaj Agarwal, Vice-Chairman, GL Bajaj Group of Institutions, from Sh. Akila Viraj Kariyawasam, Hon. Minister of Education, Srilanka in the glittering award ceremony. Mr. Agarwal shared that GLBIMR is not just an institution which imparts world-class education, but an experience where everyone associated is part of a team which has a common mission - to see that we nurture truly great leaders. GLBIMR has been crowned with yet another glorifying award at the 18th National Management Summit on “Leading Transformation of the Organizations in the Digital Age" held at The Suryaa Hotel, New Delhi on Feb 3, 2017. It was a matter of great pride & joy when Dr. Urvashi Makkar, Director General, GLBIMR received the “FORE-TOP RANKERS EXCELLENCE AWARD FOR ACADEMIC LEADERSHIP” from Padma Shri Dr. Pritam Singh, Non Executive & Independent Director, Hero MotoCorp and Mr. Mahesh Singh, Board Member, Indian Railways, in the presence of Mr. V.S.K. Sood, CEO of Top Rankers Management Consultants and Dr Jitendra Das, Director FORE School of Management. 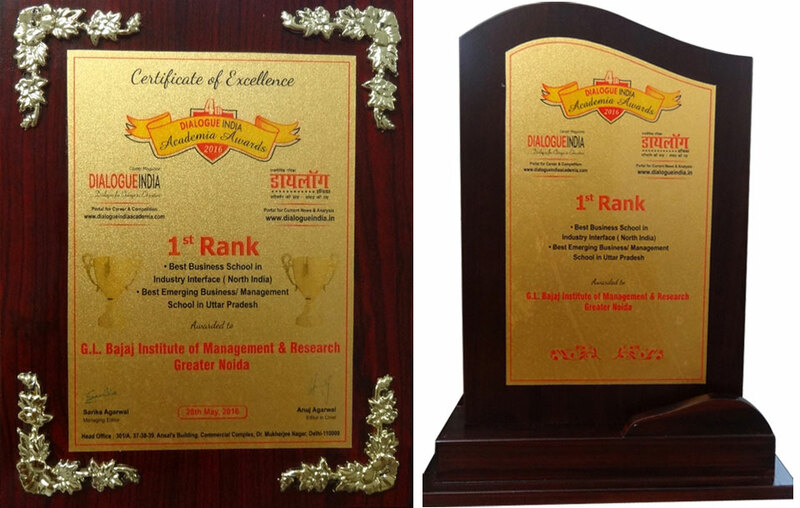 GLBIMR was the only Academic Institute to receive this elite honour, among all top Business leaders. It was a gala event where the glitterati from various industries & business houses were present and the leaders were awarded. Dr. Makkar shared that GLBIMR is achieving great honours due to continued passion and hard work of its efficacious team & insightful guidance of Mr. Pankaj Aggarwal, Vice Chairman, GL bajaj Group of Institutions. Awards of such splendid stature will add to the glorious heritage of GLBIMR not only today but for coming decades. GLBIMR is dedicated to continue the legacy of imparting excellence in education always. We congratulate all the GLBIMR family members for this great achievement. 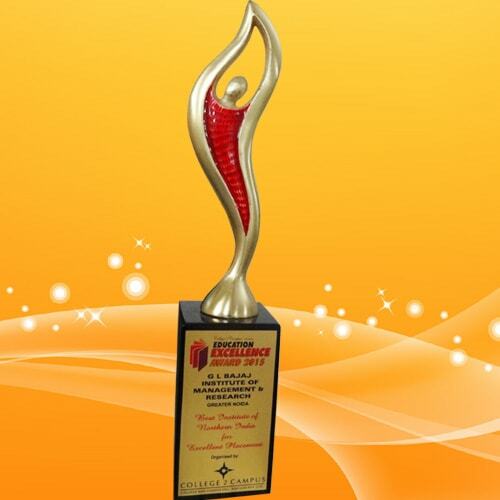 GLBIMR awarded as Best Institute in Asia with Strong Corporate Connect by ASSOCHAM. 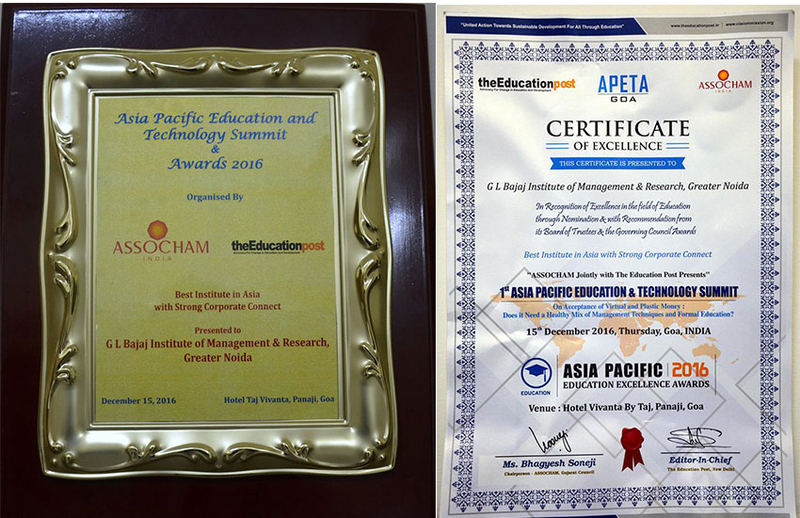 We are proud to announce that keeping the legacy of achievements ahead, GLBIMR has been conferred with yet another award of “Best Institute in Asia with Strong Corporate Connect” in Asia Pacific Education and Technology Summit & Awards (APETA) organised by ASSOCHAM in association with The Education Post on December 15, 2016 in Hotel Taj Vivanta, Goa. Dr. Urvashi Makkar, Director General, GLBIMR received the award in the scintillating ceremony, which witnessed the presence of more than 200 delegates from various institutes, universities and corporate from all over India. During the event, Federation For World Academics (FWA) concept was also launched. Congratulations to GLBIMR Family!! Dr. Makkar mentioned that these achievements could not have been possible without the constant guidance of Mr. Pankaj Agarwal, Vice Chairman and endless team efforts of GLBIMR team. Achievements like this will motivate us to stride together to achieve zenith of excellence in management education. GLBIMR bestowed with Best BSchool in Industry Interface (North India) & Best Emerging Business/Management School of Uttar Pradesh by Dialogue India. 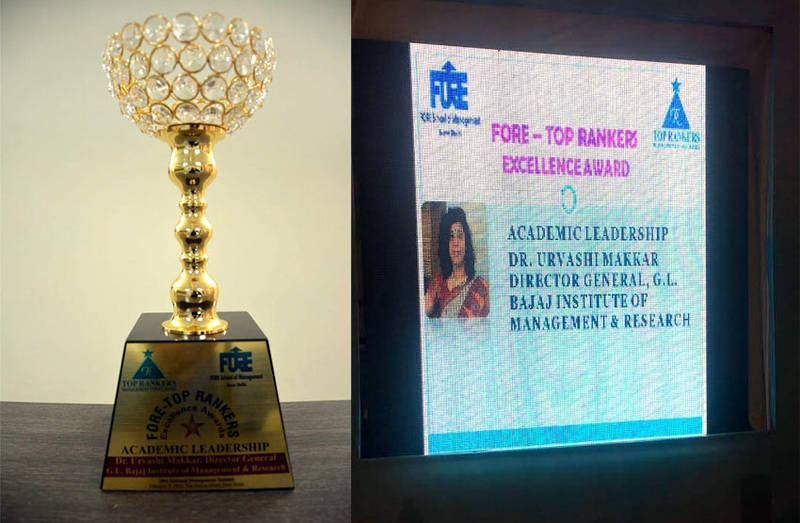 It is an honour to share that the strategic acumen of Dr. Urvashi Makkar, Director General, GLBIMR Greater Noida has resulted in more laurels for the Institute - Best B- School in Industry Interface (North India) & Best Emerging Business/Management School of Uttar Pradesh by Dialogue India. The Institute has been awarded with these prestigious awards for outstanding performance and significant contribution towards achieving Education Excellence in India. Dr. Urvashi Makkar shared that these achievements would not have been possible without the constant guidance of our esteemed Vice Chairman Shri Pankaj Agarwal of G.L Bajaj Group. The award ceremony was solemnized on May 28, 2016 at Ashoka Hotel, New Delhi, in a glittering event which witnessed the presence of around three hundred senior academicians and Industrialists across the whole country. Editor Choice Education Excellency Award for Best Director to Dr. Urvashi Makkar, Director General GLBIMR by Dialogue India 2016. 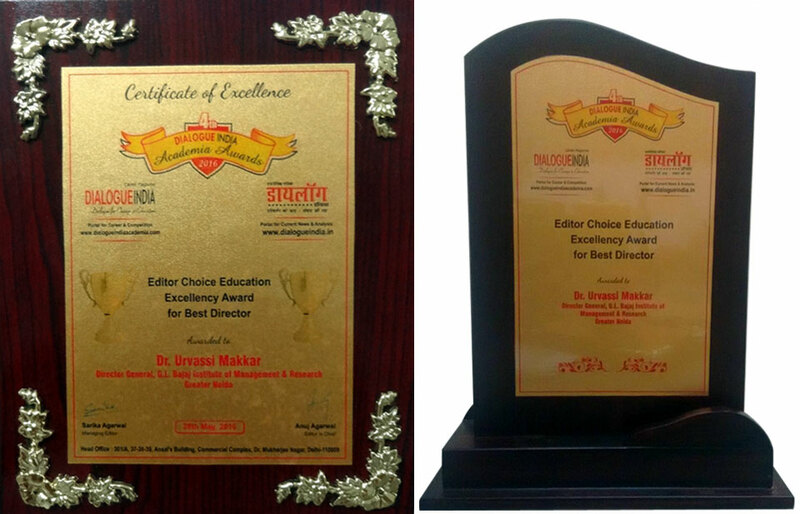 We are proud to share that Dr. Urvashi Makkar, Director General, GLBIMR, Greater Noida has been bestowed with “Editor Choice Education Excellency for Best Director” Award by Dialogue India 2016”.The Institute has been awarded with these prestigious awards for the outstanding performance and significant contribution towards achieving Education Excellence in India. During her address, Dr. Urvashi Makkar mentioned that these achievements would not have been possible without the constant strategic guidance of our esteemed Vice Chairman Shri Pankaj Agarwal. The award ceremony was solemnized on May 28, 2016 at Ashoka Hotel, New Delhi, in a glittering event which witnessed the presence of around three hundred senior academicians and Industrialists across the whole country. Dr. Urvashi Makkar, Director General, GLBIMR was also invited as an eminent panelist during the panel discussion held at “2nd Dialogue India Academia Conclave”. The theme was Industry Academia Connect - The future of Private Higher Education in India. She enlightened the audience by highlighting the key challenges faced by the Higher Education Institutions and how to improve the quality of Management Education. Eminent Director Award to GLBIMR Greater Noida. 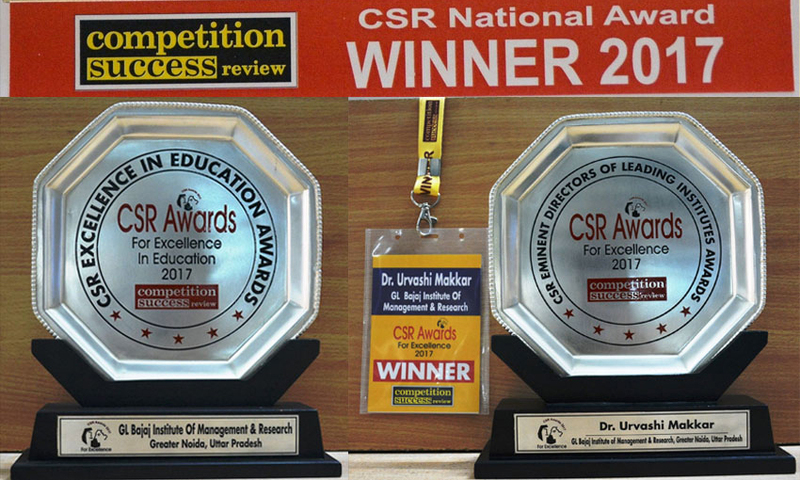 We are proud to share that Dr. Urvashi Makkar, Director General, GLBIMR Greater Noida has been bestowed with the "Eminent Director of Leading Institute of India" Award by Competition Success Review (CSR). Our Institute GLBIMR has been awarded with this prestigious award for the significant contribution towards achieving Education Excellence in Indian Society. Mr. S.K Sachdeva , Founder and Managing Director of Competition Success Review (CSR) conferred the award to our Director General, Dr. Urvashi Makkar, GLBIMR Greater Noida. During her address, she mentioned that these achievements would not have been possible without the constant guidance of our esteemed Vice Chairman Shri Pankaj Agarwal of GLBIMR Greater Noida. The award ceremony was solemnized on April 24th, 2016 at Le Meridien, New Delhi, in a glittering event which witnessed the presence of around two hundred senior academicians across the whole country. It is an honour to share that the strategic acumen of Dr. Urvashi Makkar, Director General, GLBIMR Greater Noida has resulted in another laurel for the Institute. 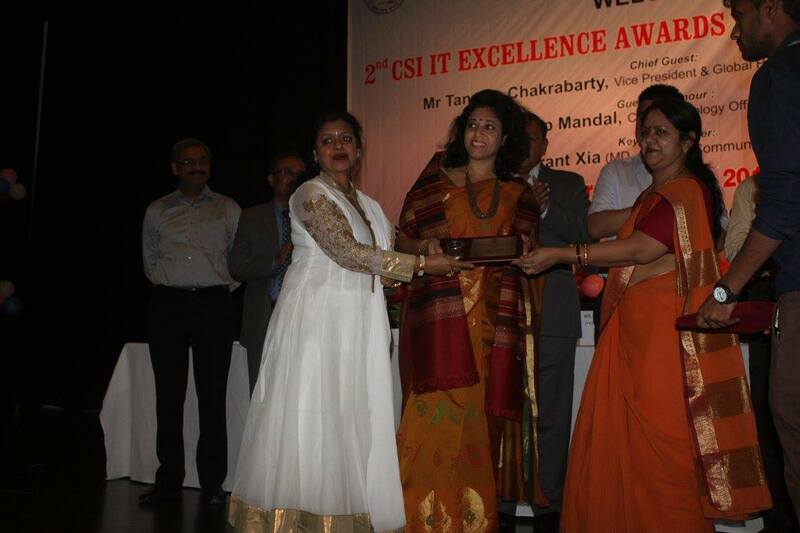 The Computer Society of India, Ghaziabad Chapter awarded ‘CSI IT Excellence’ Award to Dr. Urvashi Makkar for her significant and extensive contribution towards education in Ghaziabad. The award was conferred by Mr Tanmoy Chakraborty (Vice President & Global Head Government ISU, TCS), Mr Anup Mandal ( Chief Technology Officer – HT Media Ltd), Mr Grant Xia (MD, Cathay Communications, China), (Shiv Kumar – RVP, North India – CSI & DGM – NIC).During her address, she mentioned that these achievements would not have been possible without the constant guidance of our Vice Chairman Shri Pankaj Agarwal of GLBIMR Greater Noida. The award ceremony was solemnized on April 9th, 2016 at ABES Engineering College Ghaziabad. GL Bajaj Institutions Conferred with Education Excellence Award 2015, Best Institute of Northen India for Excellent Placement : 5th August 2015. GL Bajaj Institutions Conferred with Outstanding Placement(North) by Star News, Mumbai on date : 16th February 2012. 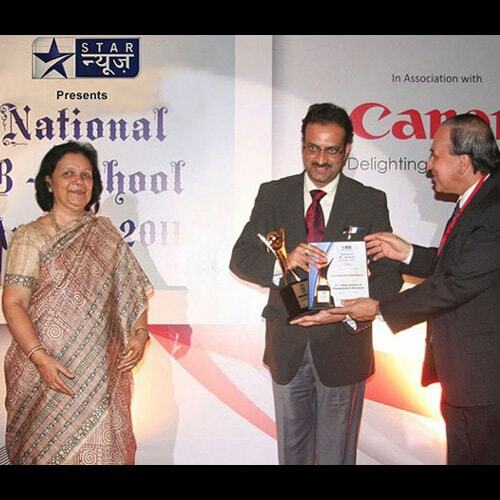 GL Bajaj Conferred with Outstanding B School Award by Star News, Mumbai on date : 12th February 2011. 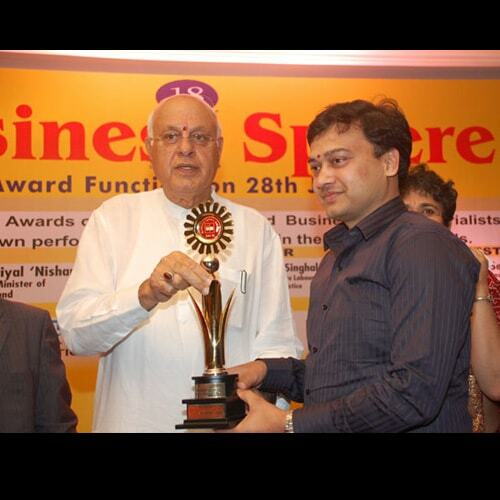 Shri Pankaj Agarwal, Vice-Chairman, G. L. Bajaj conferred with International Achiever's Award 2010 for Management & Technical Education Excellence in 25th INDO-THAI Entrepreneur's Summit, Bangkok. Shri Pankaj Agarwal, Vice-Chairman of the Group receiving the Bhartiya Shiromani Puraskar and Gold Medal for Excellence in Management Education. Presented by: Sh. Shekhar Dutt, Governor of Chattisgharh, Sh. Devanand Konwar, Governor of Bihar, Sh. K P S Gill, Former Director General of Police Punjab. Shri Pankaj Agarwal, Vice-Chairman, G. L. Bajaj Group of Institution, receiving the Award for Best Meritorious Results and Qualified Faculty. Presented by: Dr. Farooq Abdullah Minister of New and Renewable Energy, Govt. of India. G.L. 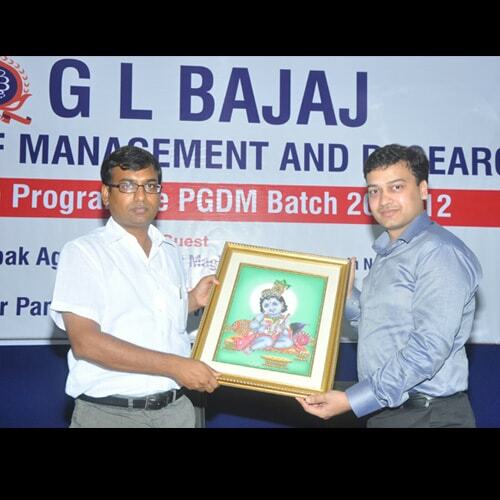 Bajaj Received Award for Best Management Institute, NCR Sh. Jai Prakesh Agarwal, President Delhi Congress. The G L Bajaj received Award for Excellence in Management & Technical Education from Sh. M. S. Bitta, Chairman of All India Anti Terrorist Front. Shri Pankaj Agarwal, Vice-Chairman of G. L. Bajaj Group of Institutions Presenting the ‘Token of Appreciation’ to Mr. Deepak Agarwal, District Magistrate, Gautam Budh Nagar on the inauguration of Orientation Programme of PGDM Students (Batch 2010-12).